​Us skin loving women are always searching for the next best thing. Whether that be the newest overnight face mask, eye cream, or those crazy pimple popping devices that are taking social media by a storm, we are devoted to find the best products and devices to revolutionize our skin care routine. Though, we often overlook the most essential step of every skin care routine. The cleansing. It turns out, maybe our hands and a washcloth don’t really get all the dirt, makeup, and days’ worth of grime. So what do you use? An electric facial cleansing brush. Though these are nothing new to the skin care market, now nearly every brand has created their own cleansing brush and some have even perfected theirs. What Facial Cleansing Brush Should You Choose? Though it’s not hard to find a best electric face brush for you, it’s something worth looking into. After all, this device is supposed to rock your world. There is such a large selection of different brushes and brands so we’ve narrowed it down to the best face cleansing brush to make the job easier for you! This list covers the best facial brushes at an assortment of different prices! Here’s a brand we all know and some of us love. Olay has created the Olay ProX Advanced cleansing system. The Olay ProX is one of the best facial cleansing brush and is quite affordable too. The packing itself is compact, easy to use, and a simple white color. This brush would be considered a great option for someone who is looking for their first cleansing brush. The Olay ProX cleansing system includes the 2-speed facial cleansing brush, cleansing brush head, exfoliating renewal cleanser (0.68 oz.) and batteries so it’s good to use the moment you pull it out of the package! Here are some features that have put this cleansing brush on our list: its dermatologist formulated and tested, it’s water resistant, and can be used for all skin types. To use the Olay ProX advanced cleansing system, dampen your face and brush head lightly with water. Apply the ProX by Olay Exfoliating Renewal cleanser to your face and massage into skin. Turn on cleansing brush and gently move around the face for approximately 60 seconds, avoiding the eye area. Rinse face and cleansing brush head with water. The olay face brush can be used daily till you achieve desired results. Make sure to replace your olay face brush head every 3 months or sooner if your brush bristles wear down! It runs on 2 AA batteries which is included in the kit. The Clarisonic Mia2 is one of the most popular facial cleansing brushes on the market. Most commonly found in higher end cosmetic stores like Sephora and Ulta, Clarisonic Mia2 boasts big reviews from beauty gurus and has been featured in multiple magazines. With the Clarisonic Mia2 being so popular and one of the best facial brush, it does come at a more expensive price. This brush is available in 4 different colors; Sea Breeze, Lavender, Pink, and White. The Clarisonic Mia2 comes with the device itself, a charger, and a facial cleansing gel. Though this brush doesn’t come with an extra brush head, the Clarisonic face brush is equipped with an interchangeable head. You can choose and customize the brush head to fit your skins needs. Choose from everyday cleansing brush heads, targeting brush heads for cleaning deeper into pores or for special acne, or go beyond cleansing with the foundation brush. Check it in action below. The Clarisonic face brush uses Oscillation technology. With spinning and rotating, the brushes can twist and tug on delicate skin. The gentle back and forth movement paired with water, creates a vacuum effect to remove dirt, oil and makeup from the skin's surface and pores. To use, Apply cleanser directly to skin or to the Clarisonic brush head, wet the brush head and cleanser, place brush to forehead and turn on, select your desired seed (2 speed option), follow T-timer prompts while gently moving the brush in circular motions. It is powered by a rechargeable battery that gives 100 minutes of operation on a full charge of approximately 18 hours. Use the Clarisonic Mia2, twice daily for 60 seconds each. The device is also 100% waterproof making it convenient to use in shower as well. Essential skin solutions is a multi-headed brush that offers head to toe cleansing with the help of four interchangeable heads. The device comes with a big exfoliating body brush, sensitive facial brush, firm microdermabrasion facial brush and pumice stone callus remover head. The sensitive brush works to remove excess oil, dirt and reduce the appearance of pores, acnes and blackheads. It is best suited for daily use to keep your skin clean and clear. The microdermabrasion brush is used to exfoliate the skin to keep it young and healthy. It can also reduce and prevent acnes and blackheads as well as prevent ingrown hairs. This Essential skin solutions facial brush is fully waterproof so that you can use it in your shower. The pumice stone head gets rid of dead skin from your feet and heels. The unit works on 4 AA batteries making it easily portable. Though this may look simple it has all essential features making the ESS sonic facial brush one of the best electric face brush for beginners. Furthermore, the ESS facial brush is not expensive as other brands, meaning you may even save money in the long-term! If you’re looking for an aesthetically pleasing facial brush, the Kingdomcares brush boasts some great packaging and color selection! This small handheld device is sleek and simple featuring a simple on/off button. The Kingdomcares facial cleansing brush comes in 4 different colors; pink, purple, blue, and white. This facial brush is reasonably priced and comes with the brush, 2 attachable brush heads, an inductive charger, manual, and packing pouch, perfect for travel! Our favorite part about this facial cleansing brush is it’s in IPX6 waterproof design. The waterproof and washable brush can be cleaned to avoid accumulation of dirt. The rechargeable brush also has inductive charging stand to charge the device cordlessly. Don’t worry about hard-to-remove makeup, the facial brush effectively working as a professional exfoliator to reduce dry and rough skin, firm fine lines, laxity. The facial brush can also pleasantly refresh skin tone, firm skin, refine skin regeneration, and can recover skin fairness. Introducing the Foreo Luna Mini 2 silicone face brush! This brush is widely known among the beauty community and is raved about often on places like USA Today, Popsugar, and Gizmodo. The Foreo Luna mini 2 is perfect for all skin types and is an enhanced facial cleansing brush. Eliminating blemish-causing impurities with its extremely gentle 3-zone brush head and 8 adjustable intensities for a fully customizable cleansing experience. It is made of ultra-soft hypoallergenic medical grade silicone bristles which are pthalate and BPA free. You can choose between 5 different colors and take it on the go. Just one charge will last over 300 uses so you will never have to bring that charger with you when you’re traveling. For when your Foreo Luna Silicone face brush does need a charge, it’s conveniently USB rechargeable, and charged in just 60 minutes. To use, apply your favorite cleanser, wet the Foreo Luna mini 2 and turn it on, massage and glide on face for 1 minute, and just rinse and dry when done! 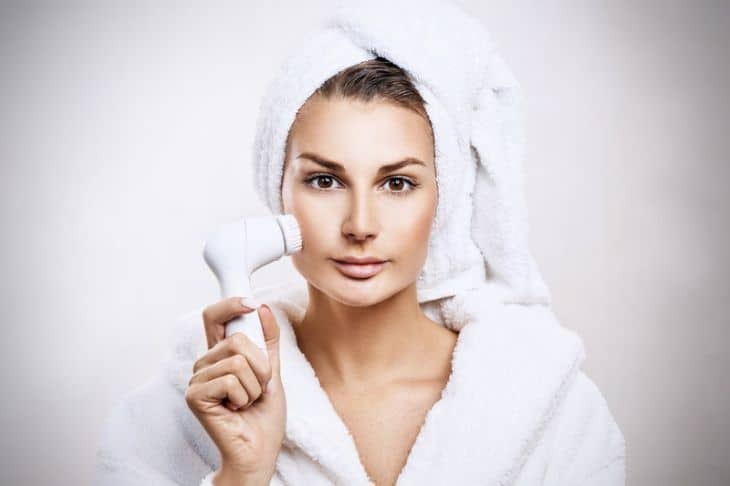 You may be eager to move on to a fancy cleansing brush after year of just using your hands, but before buying a facial cleansing brush the are a few things you should know. Skin Type- Though the brushes on our list are suitable for nearly any skin type, consider the risks. If you’re prone to super sensitive skin, you may be hesitant to try a facial cleansing brush. Maybe you’re someone who wears makeup daily and needs something extra to get all the gunk and build up from your pores. Whatever the case may be, always consider how your skin will react to using a new device. Budget- Is investing in a facial brush right for you? From prices as low as $25 to $140, it still is an investment no matter the cost. Many consider it a worthwhile purchase, as many see significant changes in their skin. A facial cleansing brush is a valuable component to any skincare routine. Remembering that gentle exfoliation and safe products are the number one key to getting the most out of your brush! Extras- As you purchasing a facial cleansing brush/system, it may be beneficial to make sure it includes compatible things like chargers, extra brush heads, cleansers, or carrying cases. Each of the facial brushes listed above are great for both newbies to the electric facial brush world or someone who is simply looking to purchase a new one. Whatever the case may be, each brush is listed for it’s own special reasons. However, there is a clear winner when it comes to getting the best face cleansing brush for you. The Olay ProX takes the cake. Not only is Olay one of the top skincare brands today (they know what they’re doing! ), but this well-known brand offers the best colors, allows those with different skin concerns to change their brush head accordingly, and doesn’t cost an arm and a leg.